Today started with the beautiful bells ringing out across the village. Good morning Sunday. We had breakfast by the kitchen window and planned our day. This included a visit to Siellans , a nearby village. Today they are having a Saffron Festival. 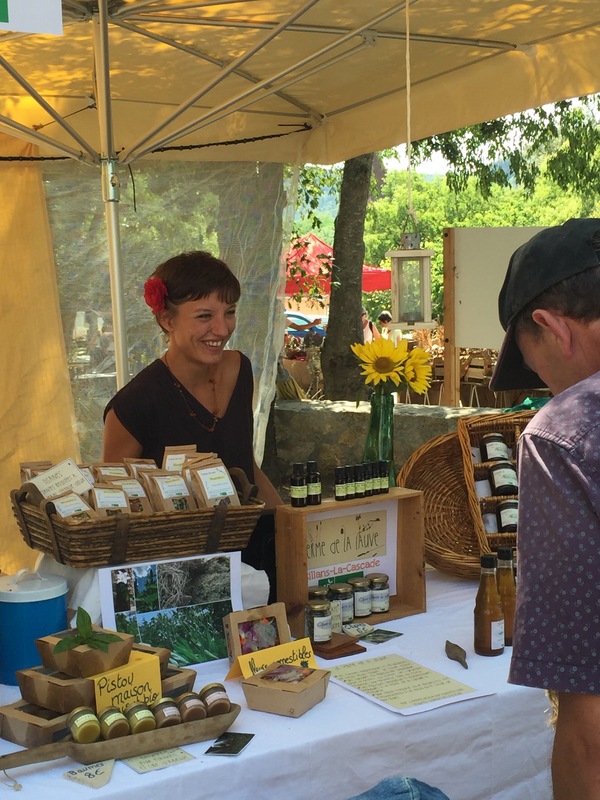 The French love a festival as much as the Italians love a Sagra. And we wanted to check it out. Before we could leave, the loud sounds came crashing though the window. The Marseillaise! I stuck my head out and there, at the War Memorial, was a band and a small group holding flags. The stirring anthem was followed with a short speech by the Mayor, another version of the Marseillaise and then they left and walked down the Main Street. Typical village life and I love it. I just need to speak French! The drive to Siellans only took about 15 mins. We found an easy park and wandered into the village. By now we needed coffee or Cafe Creme as its called here. 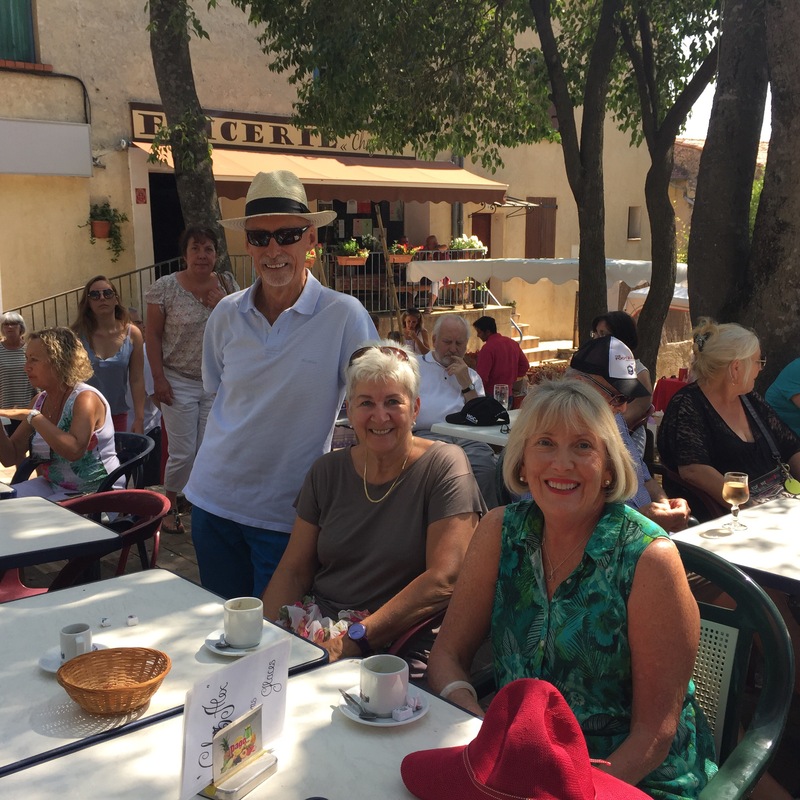 We sat and enjoyed the activity of the festival as it started to get lively, when we saw Dani, a neighbour of the Brannocks in Cotignac. In fact it was at Dani’s B&B I stayed when I first visited the Brannocks back in 2012! I had arrived in the village before they had arrived for their very first visit to the share house they had bought with friends. I found Dani and her cute B&B right across the narrow street from John and Margaret’s house. She greeted us and took our photo and told us that she would be exhibiting her stained glass at an exhibition this week. She also gave us a leaflet for a classical concert her choir would be performing at this week. 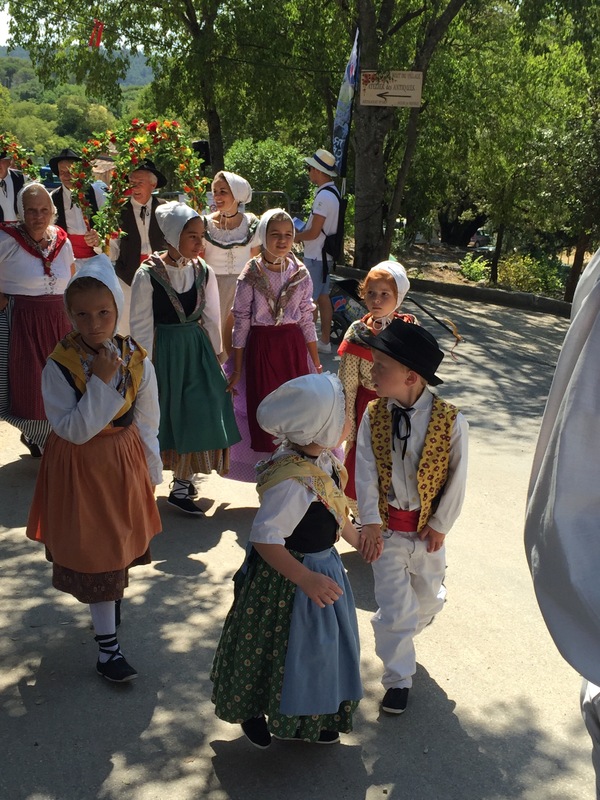 We enjoyed the activity of the saffron festival which included a l parade of little children and older people all dressed in costume, walking through the the streets to a musical accompaniment. Not unlike the one we saw in Alberobella last week. But the Italians included a silly game where they made a human donkey and tried to see how many children could jump on his back. Very funny! Here much more restrained. We bought some saffron threads for a risotto later in the week, some saffron in vin rose and some raisin cordial with a hint of saffron. 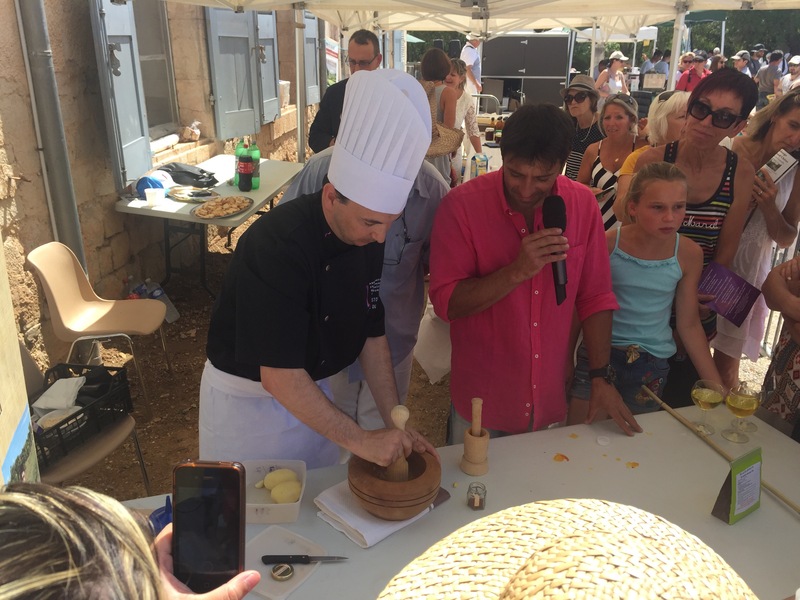 We joined the crowd for a quick cooking demonstration. So we are all set for enjoying the wares of the festival. What a wonderful start to your week!